Among the featured speakers at the opening of the Oil&Gas event included Alexander Torshin, then-Deputy Chairman of Central Bank of Russia and handler of admitted Russian agent Maria Butina. Federal authorities out of Washington DC, working in coordination with Robert Mueller’s team, have in recent days sought to arrange an interview with the author of a letter sent to Congress last month that claimed that ex-Trump adviser George Papadopoulos coordinated with Russians in the weeks following the 2016 election. The person who wrote the letter is expected to travel to DC for an interview with the FBI about the claims, per two U.S. officials involved and the author of the letter. All three have requested anonymity because of the sensitivity of the topic. The memo sent to Congressman Adam Schiff by a former confidant of Papadopoulos on November 19, as first reported by this reporter and Natasha Bertrand of the Atlantic, made a series of allegations against the ex-Trump campaign adviser. First and foremost, the letter claimed that in December 2016, Papadopoulos said “that he was doing a business deal with Russians which would result in large financial gain for himself and Mr. Trump. Mr. Papadopoulos told me that this deal with Russians would set him up for life.” The author also says that (s)he witnessed a phone call between Trump and Papadopoulos. None of the claims have been substantiated, though Congress plans to dig into the specific allegations. Exclusively obtained photos and schedules for Russian energy events in the weeks before Millian contacted Papadopoulos show that the Belarus-born Millian hobnobbed with very senior Russian government officials, sharing stages with some of the most powerful leaders in the Kremlin. George Papadopoulos, the young Trump campaign aide who pleaded guilty to lying to the FBI about his contact with Russians, was cultivated for months by a Belorussian-born businessman who has alleged ties to Kremlin insiders, according to a new report released on Thursday. Sergei Millian is reportedly Source D in the famous Steele dossier, a report compiled by former British intelligence officer Christopher Steele that alleged that Russia had been cultivating President Donald Trump for years. Millian offered Papadopoulos a consulting contract to work for a Russian whose identity is unknown, The Washington Post reported Thursday, but the young foreign policy adviser says he rejected the offer. The connection between Papadopoulos and Millian, and the businessman’s efforts to put the relatively inexperienced and eager foreign policy adviser in touch with Belorussians and Russians in the U.S., is another example of the numerous contacts between the Trump campaign and Russia. Special counsel Robert Mueller is currently investigating whether members of the Trump campaign colluded with the Russian government to influence the outcome of the 2016 presidential race. U.S. intelligence agencies have established that Russia launched a well-organized and well-financed propaganda campaign to divide Americans and discourage Democratic voters from going to the polls. The ongoing investigation has revealed numerous occasions when Trump campaign associates were in contact with Russians and attempted to hide these connections. Millian, who is now an American citizen, has claimed that he once sold units at a Trump property in Florida to Russian buyers. He allegedly speaks five languages and arrived in the U.S. in the 1990s. “He met Trump in 2007 in Crocus,” explains Olga Lautman, an investigative reporter who tracks the ties between Russia and Trump’s associates. The real estate deals in Florida were allegedly brokered in 2008. Crocus is an annual exposition held in Russia for millionaires to show off their wares. Trump allegedly attended the event to promote his brand of Trump vodka. During the 2016 campaign, Millian told ABC News that he had met both Trump and Cohen in 2008. Millian has also been linked to Oleg Deripaska, a Russian aluminum magnate who is a close ally of Russian President Vladimir Putin. In 2016, the two men were spotted together at the St. Petersburg Economic Forum, an event attended by many high-level Russian officials and businessmen. President Trump’s longtime lawyer Michael Cohen was also invited to attend the forum that year to discuss the possibility of developing a Trump Tower real estate project in Moscow. He allegedly turned down the offer because it would have interfered with the timing of the Republican National Convention. Millian has denied that he was a source for the Steele dossier, and many believe that he provided information for the report unwittingly. Last year, House Democrats issued a report claiming that Millian had refused to testify before Congress unless he received immunity. Investigators have tried to locate him without success. During his testimony before Congress, Glenn Simpson, the founder of the company Fusion GPS that commissioned the Steele dossier, claimed that Millian had worked for Rossotrudnichestvo, a cultural organization run by Russia’s foreign ministry. The Steele dossier, much of which remains unverified, claimed that Rossotrudnichestvo’s office in Prague was used as the meeting place for Michael Cohen to meet Russian officials in 2016. Cohen has denied that he was ever in Prague that year. He is now cooperating with the special counsel’s office and is due to testify before Congress at the end of February. Here's a screen cap of the Tweet Sergei Millian just deleted. Posted on April 18, 2019, at 5:07 a.m.
A senior Australian diplomat has said the government is "now ready to confirm" a series of events in 2016 between the country's high commissioner to the UK and a Trump campaign adviser, which led to US authorities investigating Donald Trump's links with Russia. 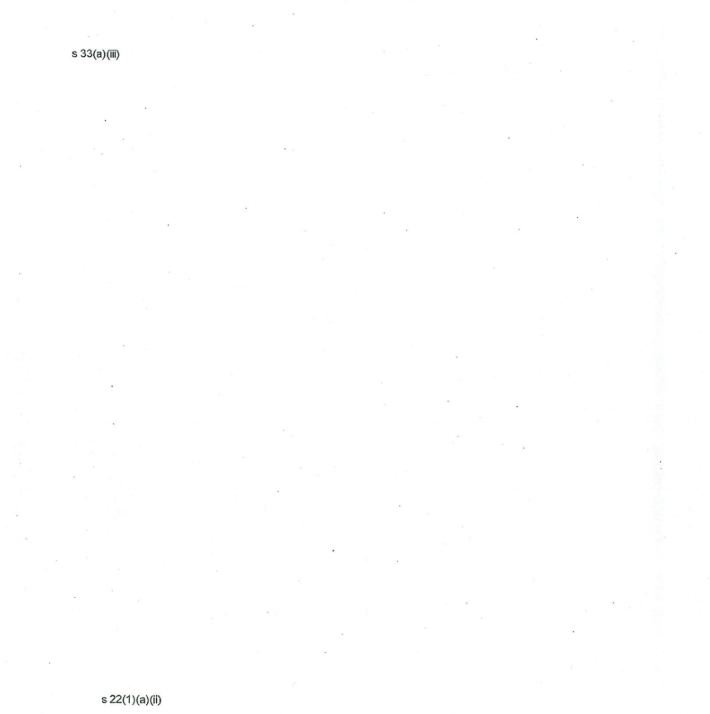 The release of the Australian diplomatic documents comes as a redacted copy of the final Mueller report is expected to be released on Thursday. The London meeting between former high commissioner Alexander Downer and Trump adviser George Papadopoulos was first reported by the New York Times in December 2017, reportedly revealing how Downer had been told by Papadopoulos that Russia had political dirt on Hillary Clinton. Until now, the Australian government and Downer have refused to confirm or give any details about the meeting central to the beginning of the Trump-Russia investigation, repeatedly citing the need to preserve national security. But in a letter sent to Australia's Information Commissioner after a 15 month-long FOI battle with BuzzFeed News, a senior foreign official said his department was ready to confirm the meeting and release redacted documents, because Special Counsel Robert Mueller's investigation was now finished. "I have again reviewed these matters and, while standing by the validity of the original decisions at the time they were made, the Department has reassessed its position in relation to Mr Di Stefano's three requests in light of the recent conclusion of the U.S. Special Counsel's investigation into Russian interference in the 2016 Presidential Election," the official wrote to Australia's Information Commissioner Gillian Cameron. 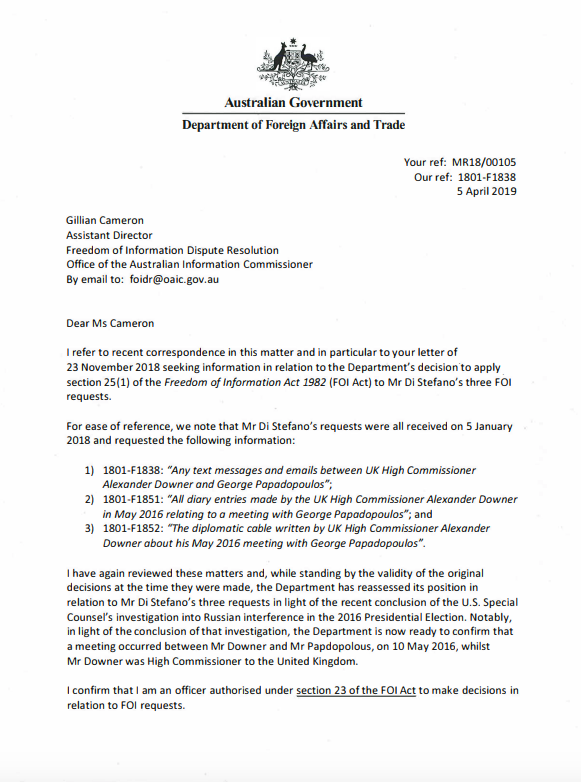 "Notably, in light of the conclusion of that investigation, the Department is now ready to confirm that a meeting occurred between Mr Downer and Mr Papdopolous (sic), on 10 May 2016, whilst Mr Downer was High Commissioner to the United Kingdom." Included in the documents released to BuzzFeed News is a calendar invite, and a diplomatic cable Downer wrote about the meeting. The senior foreign official said Downer's cable had been heavily-redacted because the full contents could "reasonably be expected" to damage Australia's relationship with the United States. 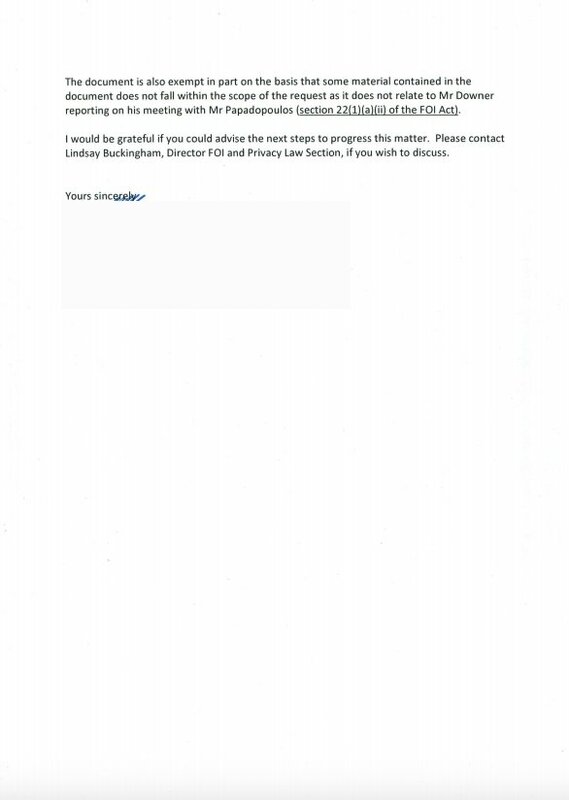 The Outlook invite (shown above) organised for Downer on Tuesday, May 10, reads, "6:00pm – Meeting with George Papadopolous (sic), Adivsor (sic), Donald J Trump for President", and includes a link to Papadopoulos' LinkedIn profile. 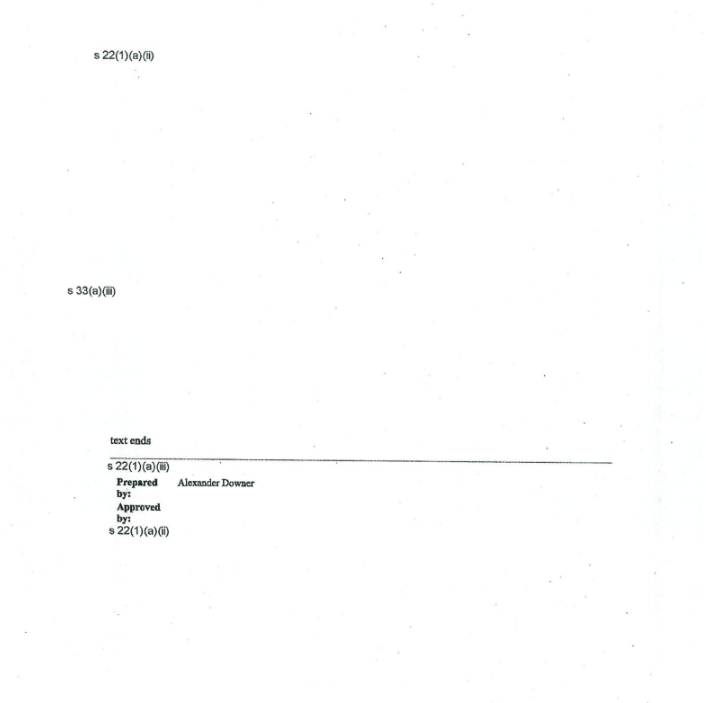 The government also released a heavily-redacted copy of the diplomatic cable (below) Downer wrote to Canberra the day after the Papadopoulos meeting. 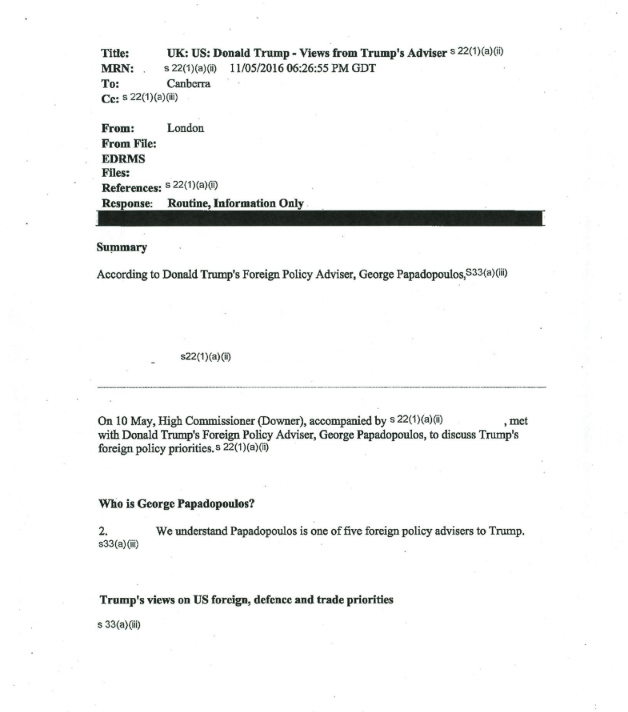 The cable titled "UK: US: Donald Trump - Views from Trump's Adviser [redacted]" runs to three pages and briefly outlines how the high commissioner met with Papadopoulos the previous evening to "discuss Trump's foreign policy priorities". The foreign official said the rest of the cable has been redacted under Section 33(a)iii of Australia's FOI Act because it "could reasonably be expected to cause damage to international relations". "Release of the full contents of this document could reasonably be expected to damage the bilateral relationship with the United States, and relationships with other partners with which we engage closely," the senior official wrote. "This would significantly impact the Department's ability to prosecute Australia's foreign policy interests." Papadopoulos was one of three dozen people charged in Robert Mueller's special counsel investigation. He pleaded guilty to lying to the FBI and served a 12-day prison sentence. Along with posting numerous tweets and appearing on US cable TV to complain about the Downer meeting, Papadopoulos has released a book called "Deep State Target: How I Got Caught in the Crosshairs of the Plot to Bring Down President Trump". 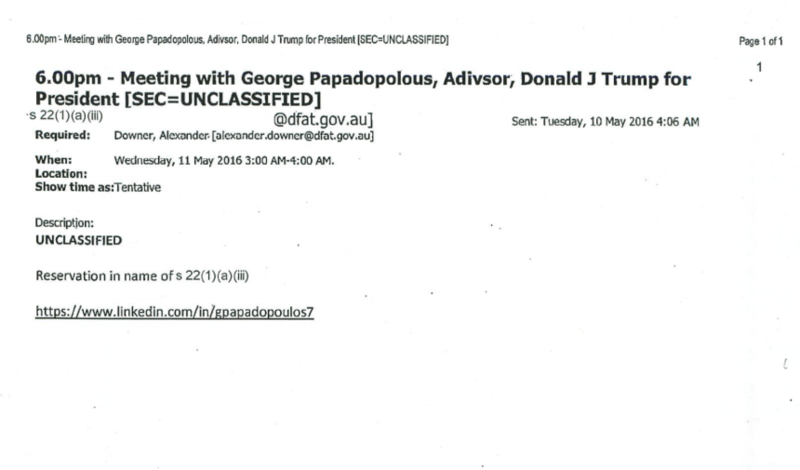 The Outlook invite lining up it up for May 10, 2016 in London – clearly showing DFAT considered Papadopoulos an “adivsor”(sic) to the Trump campaign. The very next day Downer wrote a three-page diplomatic cable to Canberra about what he was told. 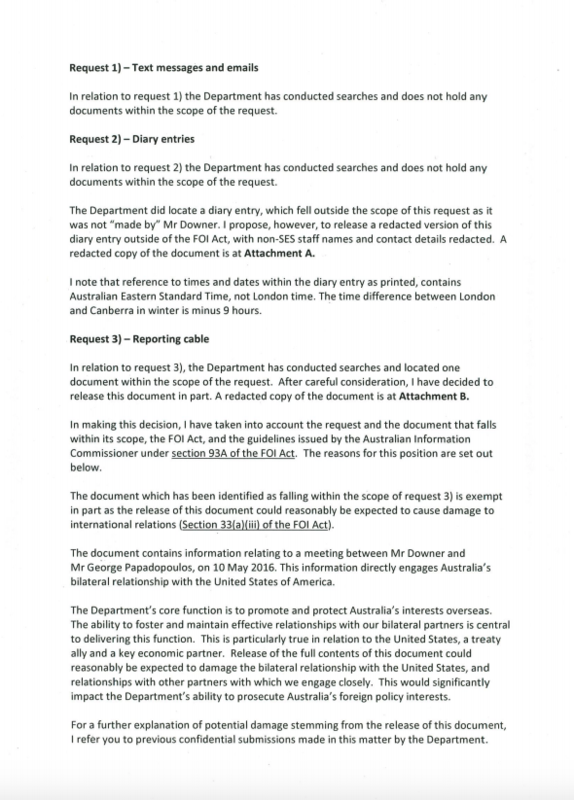 Senior Australian foreign official said they’ve redacted it because the contents could “reasonably be expected to damage the bilateral relationship with the United States"
The full letter Australia’s department of foreign affairs and trade wrote to the information commissioner about BuzzFeed News’ series of FOIs. Remember - one of the first calls Trump made post swearing in was to Turnbull excoriating him about the number of “refugees” that had to be taken in by each country .